Minimally invasive procedures help improve outcomes with less risk to the patient, faster recovery and decreased cost. And in today’s financially burdened environment, cost is always a consideration. CHI Health St. Elizabeth, a 260-bed hospital in Lincoln, Nebraska, got everything it wanted—new technology, new capabilities, new procedures to offer patients and new workflows—all without paying the cost for new—because the hospital chose the refurbished Artis zee® biplane eco from Siemens. 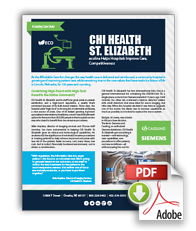 Download our case study to learn how the hospital improved care and remains competitive with a refurbished interventional lab.